Customers are responsible for all return shipping costs unless the item is being returned because of a definite error by Raney's. How do I obtain an RMA number? Log in on your www.raneystruckparts.com account using the username and password you chose when you placed the original order. If you do not remember your login information give us a call and we can reset this for you. Select the item you wish to return and then check the box next to that item. Enter all required information as indicated. Be as detailed as possible regarding the reason you wish to return the item and state the condition. Indicate what action you prefer. Depending on the condition of the product you may be entitled to a refund, replacement or a store credit. For a store credit, if you know what other items you would like the credit to be applied to, specify the product SKU Number. The difference in price will be credited or charged accordingly. 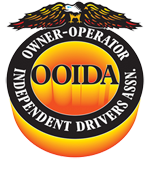 We are proud to be the ONLY company in this industry that does not charge our customers restocking fees. We are confident in our products and we want to provide our customers the BEST service, so at Raney's as long as we receive your package back in the same condition it left, there are no hidden fees. Within 24 hours, or the next business day, one of our representatives will be in contact via email with further instructions. In the event your product is damaged in transit please contact us at 1-888-888-7990 immediately. All damages must be reported within 24-48 hours of receiving your package. If a shipment arrives at your doorstep and is clearly damaged make sure to take pictures as these will help expedite the return process. 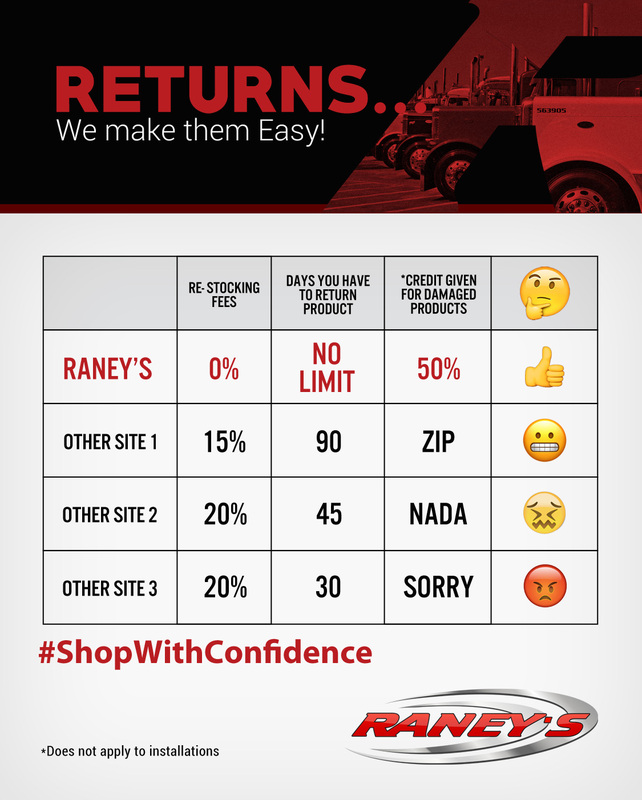 All warranty claims and damaged items claims need to be handled through Raney’s. Do not contact the manufacturer of the product directly as they will not be able to assist you in receiving a new item. If your product is received damaged or incorrect, please contact our customer service department at your earliest convenience. Please do not attempt to install the part as this will void any return options. A refund for the incorrect product will be applied, upon return and inspection. If a replacement is needed before the original product is returned, the replacement must be purchased. Above all else, we desire 100% customer satisfaction so if you need any additional information regarding our shipping and return policies please visit the contact us page of our website or call our toll-free number. In the event your item stops working or is experiencing a defect this would not fall under the normal return policy. Please contact our customer service department to receive instructions on how to start the warranty process. Orders not listed with a lead time can only be cancelled prior to the order shipping. If your item is subject to a lead time greater than 7 business days, it can only be cancelled before the manufacturing process has begun. If the order needs to be cancelled before the completion of production, you will be subject to the manufacturer's cancellation fee. To avoid the cancellation fee, the order can be completed and shipped to the address on the order. When the product is received, you may contact a Raney's Customer Service Representative to obtain a RMA number to return the unwanted product. The return shipping would be at the customer's expense and the original shipping would not be refunded for cancellation scenarios.